Hand-crafted mokume gane metalwork, custom wedding rings and classes. I am proud to offer quality craftsmanship and obsessive attention to detail in all of my work here at Anneville Studio. My meticulously hand-crafted custom wedding rings, vessels, boxes, bracelets and other jewelry are all created using the traditional metalsmithing tools of file, handsaw, torch, and hammer. I fuse my own mokume gane billets and create everything from scratch using ethically sourced metals. Browse ring designs and get a free quote. Anneville Jewelry Lab is San Diego's newest jewelry co-working space. Our fully equipped metals lab offers classes, workshops, hourly bench rental, exhibitions, and networking opportunities. 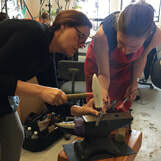 Whether you'd like to take a short beginning soldering class, dive in to a week-long workshop on mokume gane, or just need a place to hammer and roll, the Jewelry Lab can help! Learn more about our open lab. Fabricating with Square Wire, Part 2 - 1 spot left! Experience the excitement of watching a 20-ton hydraulic press in action! Anneville Jewelry Lab member Janet Herman will share her knowledge, experience and cool collection of dies to demonstrate how she creates bees, lions and more out of copper and silver. Janet will discuss her research using different types of metal and share some of the tips and tricks she's learning in working in this interesting technique. See more pictures and get details. The Anneville Fair Team is an informal group of makers working together on wearable jewelry projects for the San Diego County Fair. Enjoy team camaraderie and support, get free weekly coaching sessions with Anne and Julie, work together on Weekly Team Days in the Lab (optional), get online entry and labeling help by Ame, take advantage of delivery and return of your piece to and from the fair AND join us for a fun Field Trip to view our entries and have lunch. You might even win Fair Awards! Learn more and download a flyer.